I am a big fan of David Liss‘s work, especially A Conspiracy of Paper, a historical mystery set during the the world’s first stock market crash, which will give some insight into what happened nearly 300 years ago, wrapped up in a story of pugilism and prostitution. And then, once you’ve finished A Conspiracy of Paper, you can read The Coffee Trader (the introduction of coffee to the commodities exchanges in Amsterdam in the mid 17th Century) and A Spectacle of Corruption (about the machinations involved in an early 18th Century British national election) … all are timely novels to read in the current political and economic climate … a little history to put current events into perspective. David Liss’s new book, The Whiskey Rebels is finally available. Set in and around Philadelphia, Pittsburgh and New York City in the years after the Revolutionary War, this clever thriller from Liss (The Ethical Assassin) follows the adventures of Ethan Saunders, once a valiant spy for General Washington, who’s fallen on hard times by war’s end. Suspected of treason, Ethan has lost the love of his life, Cynthia, who’s married the fiendish Jacob Pearson, an entrepreneur who managed to prosper during the British occupation of Philadelphia. At Cynthia’s urging, Ethan agrees to go looking for the missing Jacob, prompted in large part by a desire to redeem his reputation. Meanwhile, the so-called whiskey rebels on the western frontier are trying to bring down the hated Alexander Hamilton and his Bank of the United States. The courageous Ethan is a likable rogue, and even though Ethan spends too much time delving into the complications of 18th-century finance, he can be counted on when the chips are down and the odds against him soar. 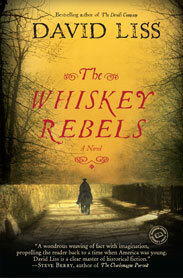 Picked up my copy of The Whiskey Rebels last night, and am already thoroughly engrossed.